Thank you for all the ways that you give to RMCC! Our church's ministry would not be as effective or possible without you. 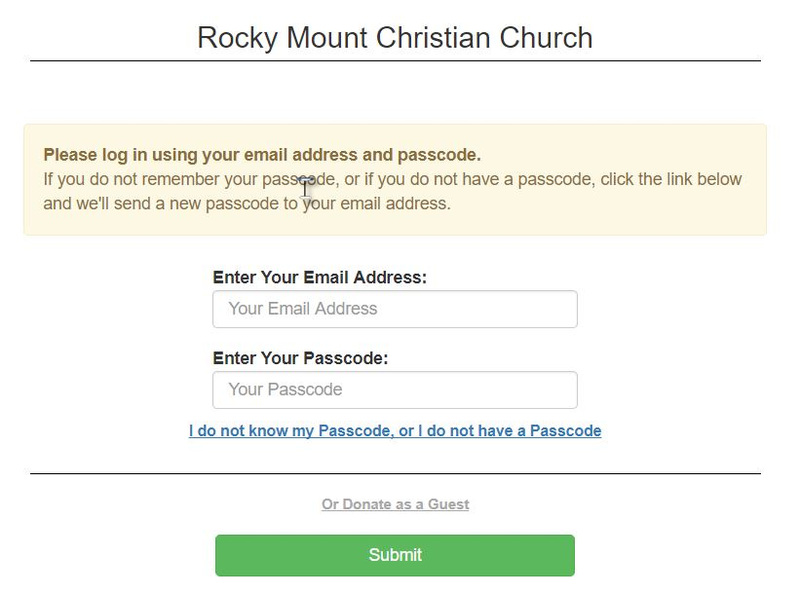 Below are some of the ways you can donate to Rocky Mount Christian Church. You can always donate your time to the church. Talk to Pastor Matt and he'll help you find your niche for giving back. The church and the situations it faces always need your prayers! With the stock market setting new highs over the past few weeks, now may be the best time for you to consider making your gift using appreciated stock in your portfolio. Gifts of appreciated stock you've owned for more than a year provide you a double benefit: Assuming you itemize your deductions, you can deduct the full fair market value of your contribution; and you will avoid the capital gains that may have been due if you had sold the stock yourself and then gifted the proceeds. Therefore, contributing the appreciated stock outright rather than selling the stock and contributing the cash proceeds greatly increases the tax benefits from your gift. (Wording was borrowed from Young Life). Please talk to Pastor Matt, the office, or the Treasurer if you have an interest in donation through this route. Some peole choose to leave Rocky Mount Christian Church a gift in their estate as they work with their financial planner and/or lawyer. RMCC is grateful for any size gift that is left at the end of someone's life and we work very hard to use that gift responsibly. You may always donate by check or cash in person or by mail. It is not recommended to send cash by mail. Simply make your check out to Rocky Mount Christian Church and put "General Offering" in the memo. If you give cash during a service or by dropping it off at the office, please make sure it is in an envelope that has your name, date, and "General Offering" on it. Click here to give online. Instructions are below. You may also donate to RMCC through the Givelify app. You are now able to give to the church online, if that is your preferred method. For the church, there are no setup or recurring monthly fees. Please be aware that there are some fees for giving online, as is true with giving online to any organization. The fees are as follows: The only thing we pay is Stripe's industry standard 2.9% plus 30 cents for each credit or debit transaction. If you give a check, there is a flat 25 cents for each ACH transaction. So, if you give $10 through a credit or debit card, you will only be charged $10. The church will receive $9.41 after the fees are collected. If you give $100, the church will receive $96.80. If you give $10, you will still get a $10 contribution credit at the end of the year. Fees do not affect that. Obviously, the church and you will get the maximum benefit if you continue to give through paper-check or cash. Also, doing an electronic check (where you enter your routing number and account number) will only cost 25 cents. So, that is a very good method for giving. Even though there are fees for the company that processed the cards, we want to have every avenue open for giving. You can donate on the Givelify app or through the instructions below. Click or copy and paste the link below in your internet browser. Register with your email address or Click "Or Donate as a Guest" at the bottom of the screen. Enter all of your contact info and payment info. For the Category, please select "18 General Offering"
If you want to divide your gift between categories, hit the plus sign. Click, Submit and your transaction will be processed. You will be emailed a receipt. You may donate through cash, check, or online giving when the Pastor visits you. Just indicate your desire to do so.